Just over a year ago I made the switch from traditional accountancy, where I’d spent nine years of my career, to go online and join inniAccounts. It felt like a brave decision at the time, but I can confidently say it was the right one. Why did I do it? I could see that trends in technology were having a huge impact on accountancy, and it seemed right to be a part of that future. We’re entering a new age of ‘invisible accounting’, where technology is simplifying accounts management. In turn it’s making it easier for clients and accountants to focus on the things that truly add value to businesses. I’ve found that my role has evolved into something more strategic and personalised as a result – I have time to think about the things that will make a difference to people and I can give them advice that they can act on and see an immediate benefit from. I’m using skills I didn’t before and learning new ones. However, working online and using technology to streamline our day to day tasks, can mean that what accountants do – the nuts and bolts that has to be done before I can offer any advice – is often completed behind the scenes and is invisible to those on the outside. In fact clients sometimes ask how I arrived at my conclusions, because they’ve not seen me physically do anything. So, I thought I’d share with you what my average day looks like and how it complements the advice I provide. First and foremost – coffee! Once I’ve grabbed a caffeine fix, I head to my desk and dig into my emails. They’ll have already been building up over the previous evening, so when there’s a lot to go through I’ll recruit the help of my colleague Henry. This ensures we always get a prompt response back to our clients’ queries. From here, things can look different depending on the day of the week. For instance, every Monday I have a meeting with the other senior accountants to go through the accounting teams’ workload. Every Thursday you’ll find us discussing everything from new rules and regulations, ‘hot topics’that have appeared in the accounting or contracting press, as well as ensuring we’re on top of any burning client issues. Throughout the morning I typically review our clients’ P11Ds, and any tax returns that have been prepared by the accountants. This usually takes an hour or so before I move on to reviewing general accounts. This is all done inside our own bespoke software. 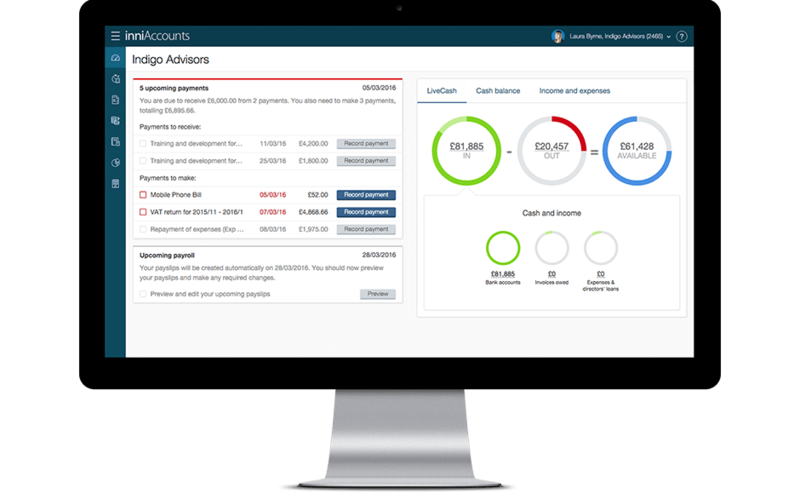 Each client has a single online portal where all their information is uploaded, updated and held – so we can find anything we need to know about the client’s accounts all in one place. During the day, I’m around to help all our accountants and account managers with their questions and provide any further guidance they may need when helping out our clients. That’s probably the best thing about working at inniAccounts – getting to work with a friendly, driven team of people who are always willing to provide help whenever it’s needed. Next, it’s a half an hour lunch and maybe a mooch around the city. Our office is based in a converted Victorian building, and a short walk away from Derby city, so I try to get a breather away from my desk where possible. I’ve come to appreciate it makes for a more productive afternoon, especially when I have a busy inbox. For the afternoon, I usually focus on pre-year end reviews with my clients. These typically take around an hour and involve a lengthy discussion with the client about the ways they could be improving their tax efficiency before their year-end. This is probably my favourite part of the job. I like to have a good natter with my clients and get to know them a bit more on a personal level. That way, I really understand them, their business and what they’re trying to achieve – so I can give the best possible advice. Having previously worked with traditional accounting firms, working at inniAccounts has been a very positive change. Everything seems to take so much longer in a traditional firm, but here we have the resources to provide a more efficient service to our clients as we’re not getting too bogged down in all the insignificant details. The software allows me to interact and advise my clients in real-time as we have the most up-to-date information right at our fingertips. If I happen to get a clear window during the afternoon, I’ll log onto AccountingWeb and have a look through the news and features. Continuous learning is a huge part of what we do here at inni; I like to ensure I’m always ahead of the game and able to use what I’ve learnt to help my clients and the team. Finally, I check our internal trackers to see if any filing deadlines are coming up before passing these over to the account managers to follow up with our clients. I’ll also use these to plan my work for the next day. The trackers are live tools that are connected to HMRC and Companies House alongside our clients’ due dates, so we always have a complete overview of any upcoming deadlines. And there you have it! My days can range anywhere from fairly relaxed to all systems go depending on the time of year, upcoming deadlines and our clients’ needs. I’ve found that working for a cloud-based accountancy firm provides a host of advantages for not just our clients but for accountants too. As well as ensuring we’re working with the most up-to-date information, technology frees up some of our time, which means I can spend more time on the best aspects of my job; like helping our clients.